This book explains the chemistry of Organophosphorus compounds (OPs), their mechanism of toxicity and the history of OPs from their initial discovery to the development of new compounds such as Novichoks. It details the harmful effects to human health both as a result of acute and chronic OP exposure and the necessary clinical management of affected patients to reduce their toxic side effects. The book also explains the detrimental effect that OPs have had on the environment and the efforts being made to prevent this in the future. Finally, the book looks at the incidents where OPs have been used as chemical warfare agents. 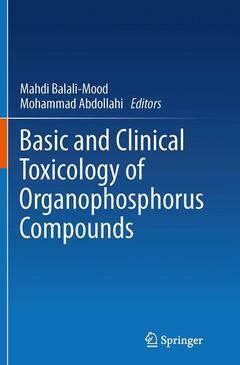 Basic and Clinical Toxicology of Organophosphorus Compounds aims to act as a comprehensive guide to all aspects of OPs and is a key resource for clinical toxicologists and related health professionals involved in the prevention, diagnosis and clinical management of OP patients, toxicologists and other scientists involved in research on OPs including regulatory issues and postgraduate students in Toxicology and related fields. Chemistry and classification of OP compounds.- History of use and epidemiology of organophosphorus poisoning.- Acute toxicity of organophosphorus compounds.- Chronic toxicity of organophosphorus compounds.- Toxicity and novel biomarkers of OP exposure.- Clinical management of acute OP pesticide poisoning.- Clinical management of organophosphorus nerve agents’ poisonings.- Occupational and environmental aspects of organophosphorus compounds.- Summary, discussion and conclusions.